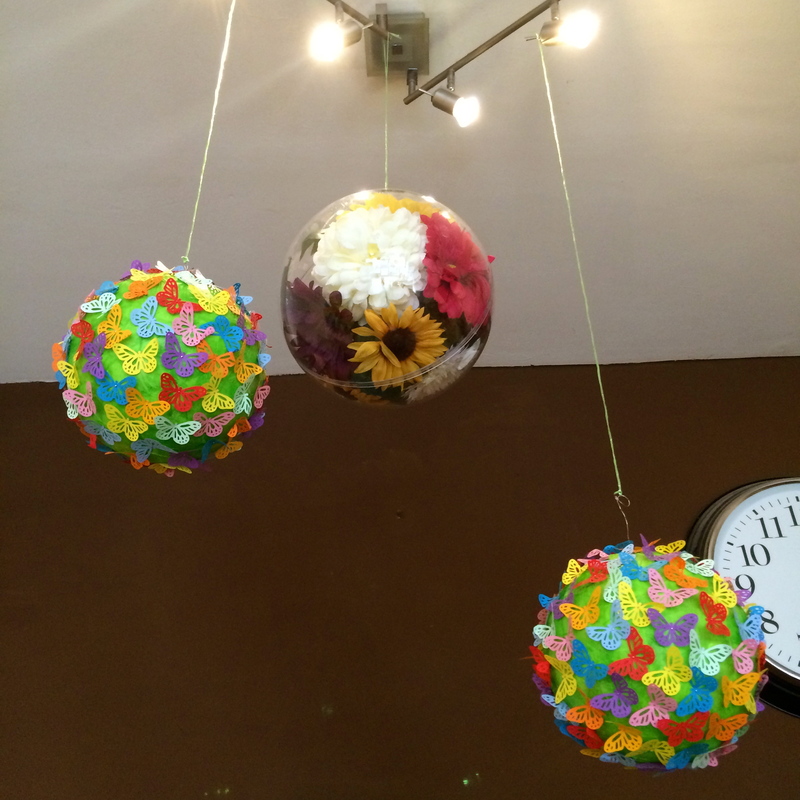 First up were flower and butterfly balls (I really do need to think of a catchier name). I feel a bit of a fraud calling these tutorials as they’re pretty obvious and really rather easy, but here we go. A variety of fake flowers – I got ours from the local Hobbycraft as the cheaper ones online meant shipping them from China and I just didn’t have the time. Polystyrene balls – I reused the ones from this previous tutorial here. PVA glue with a couple of drops of water in it to make it thinner. Butterfly stamp – I used this one – Martha Stewart don’t you know! Cut the tissue paper into squares. Coat part of the ball in glue and stick on one square at the time. 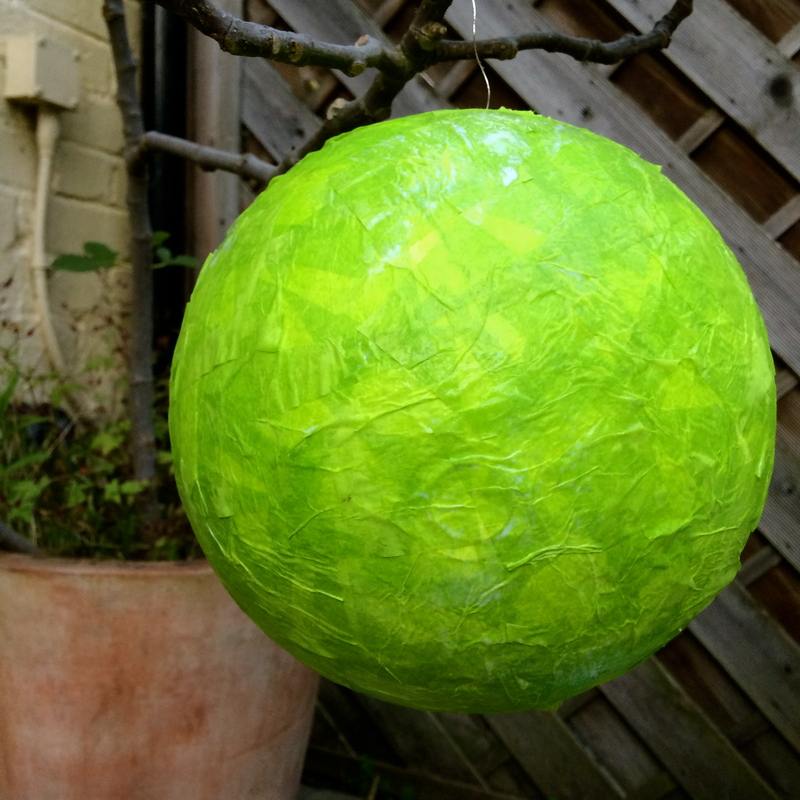 Once you’ve covered the whole ball give it another coat of PVA all over and hang it somewhere to dry. Next, repeat the process all over again and then it should be ready for the butterflies. Stamp out the butterflies then place a pin through the body of each and stick it into the ball. Repeat until fully covered making sure not to put the same colours next to each other. Once covered, pull the wings up so they’re not lying flat and, et voila, you have a lovely ball of butterflies. Easy peasy lemon squeezy. 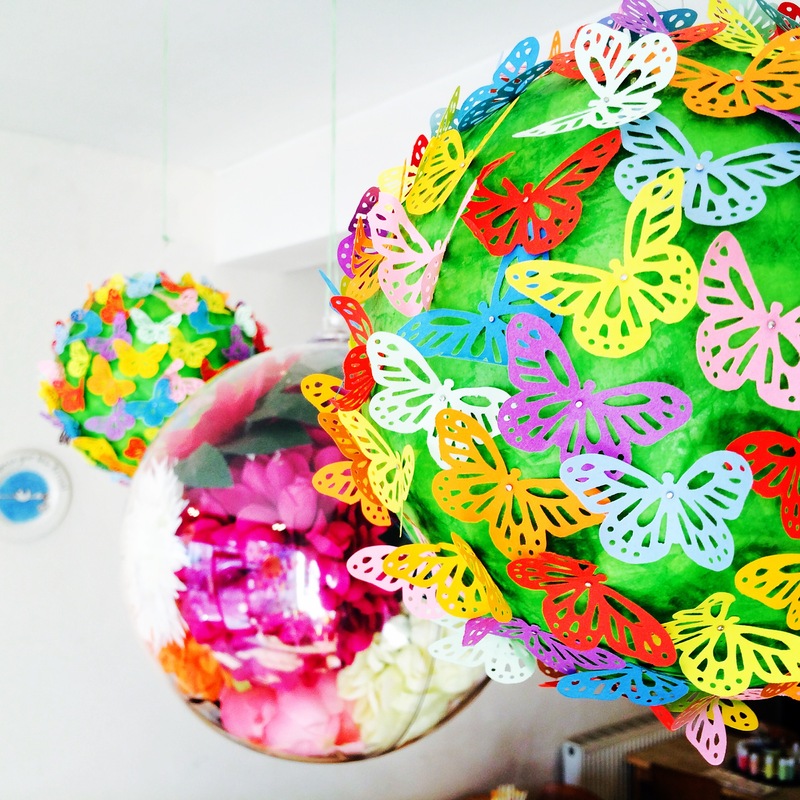 Paper butterfly balls and floating balls of flowers. Obviously. A box of 500 plastic spoons – Got to love Costco! 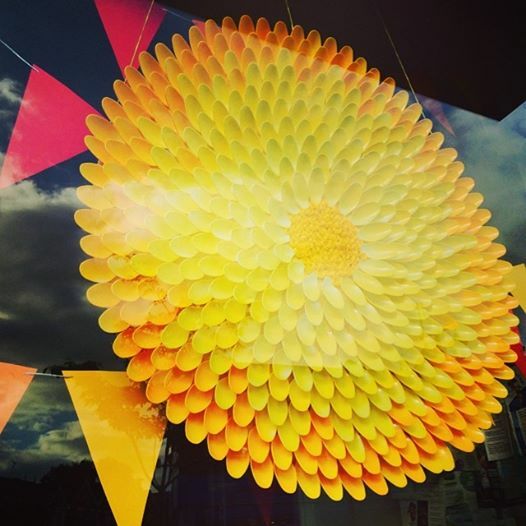 Two shades of acrylic spray paint – We used yellow and orange. Two large circles of card – We used old corrugated card from some large boxes and actually drew around our bin lid, but you could use the two-pencils-with-a-bit-of-string-tied-between-them trick. 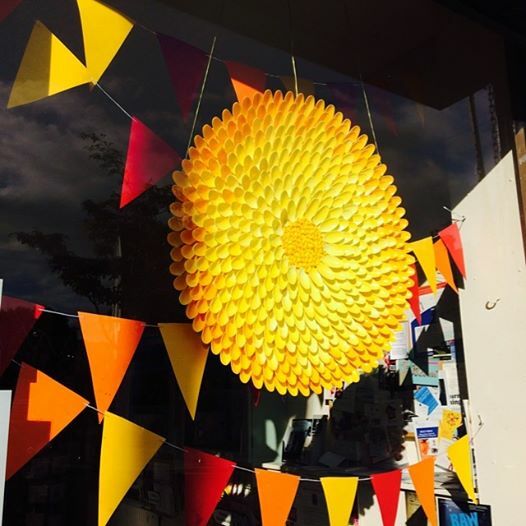 Draw two circles on the corrugated card the size you would like the sun / flower to be and cut them out. Paint one side of each in two coats of the yellow paint and leave the dry. Once dry glue the two sides together with either PVA glue or you could always use your glue gun, whichever you prefer. You have no idea how long this took and how hurty it was! 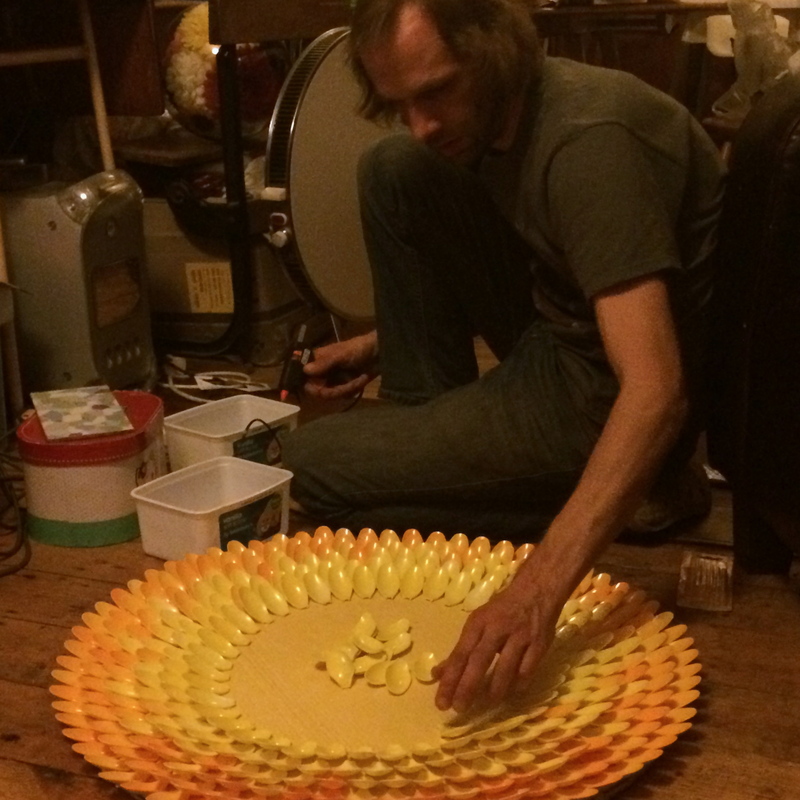 Get your mountain of spoons and start snapping the heads off. I saw scissors and craft knives recommended for this task, but I didn’t find they worked and the best way to do it was with your hands. This hurt though. A lot. We ended up with plasters on our fingers to cushion the blow, but rubber gloves may have been even better. 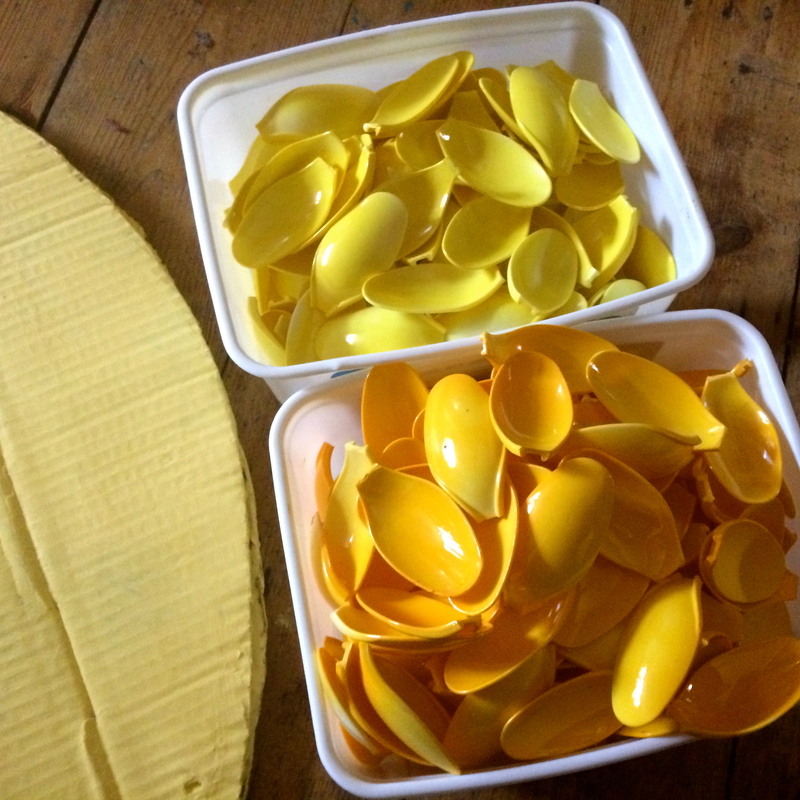 When you have enough spoons lay them out on the card so you can work out how many you want in each colour then put down some old paper and spray those spoons. I found it was best to leave them overnight to dry although they did seem to remain slightly sticky forever. 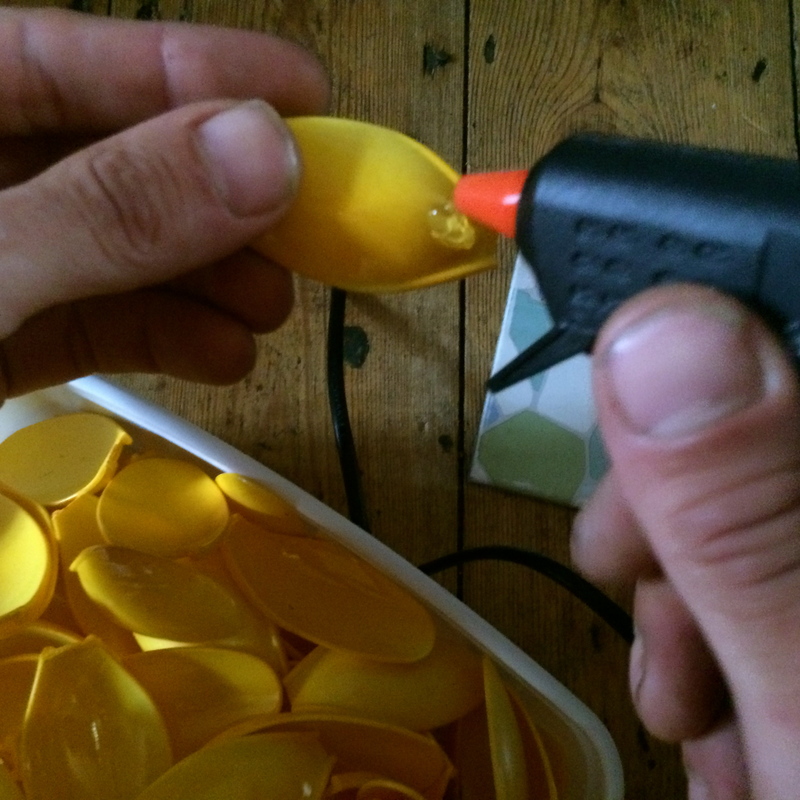 Once your spoons are ready, place a spot of glue from your glue gun on the back of the spoon at the bottom, close to where the handle used to be so when you stick it down it kind of pops up a bit. Gradually work your way around and with each layer making sure it slightly covers the one above it. Where possible put the spoons between the joins in the row above until you get as close to the middle as you want to go. 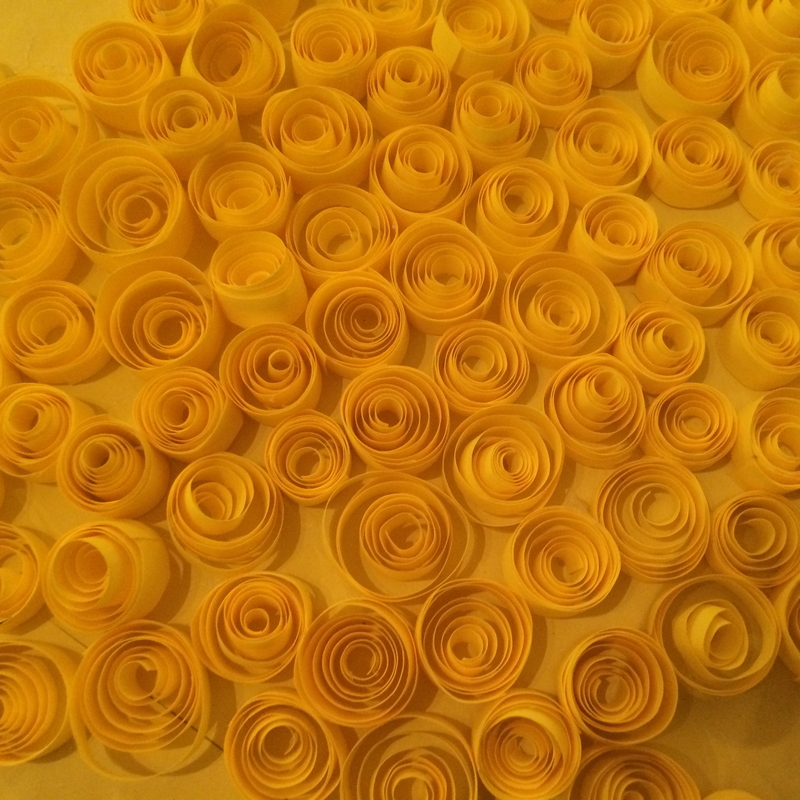 Now, you could leave the middle plain, but we decided to make our lives more difficult by trying out some quilling for the first time. For this we cut very slim strips of yellow paper (about 4mm wide but I didn’t bother trying to be too accurate). Next get a toothpick and roll the paper around it. When you get to the end, take it off the toothpick it will spring out a bit. Then get another toothpick and put a tiny dot of glue on the end and glue it to the side so you get a curled round circle. Then make some more. Then make some more. Then when you think you’ve got enough, make some more. Once you’ve finished put a layer of PVA over the centre of the circle and stick the quilled paper down very quickly and leave to dry. Finally make a hole through the card circle at the top about 1.5cm in and do the same mid way down on either side. Thread through some string and then it’s ready to hang! If you wanted to make a more permanent version of this, you could use a thin circle of wood and put a circular mirror in the middle (which you can get in Ikea). You could also make much smaller ones and I’ve also seen versions where rather than using spoons you can use rolled up paper. The craft world really is your oyster!